Too often, in Christian circles, we look at a person who is struggling with fear, and we tell them, “Have faith!” However, faith is not the solution to their problem. The solution to fear is love, not faith. I used to struggle with fear a lot. It began my freshman year in high school, when I was bullied a lot, and it continued until I was 27 or 28 years old. I was so fearful. I would have panic attacks and gasp for breath. I literally could not breathe, and this happened often. Fear was strangling me. I prayed for healing, but it didn’t seem to get better. I commanded the spirit of fear to leave me, but that didn’t seem to do much good either. The panic attacks continued. I was at wits’ end. Then one day, out of His mercy, the Lord showed me how to be healed from the fear that was destroying me. Fear was definitely tormenting me; so I knew the verse applied to me. This promise says that perfect love casts out fear. It also says that if I’m afraid, it’s because I haven’t been made perfect in love. Both the problem and the solution were exposed in this one verse. The problem was fear. The solution was being made perfect in love. The work I do to minister to people both online and in person is made possible by readers like you who partner with me each month financially, or as they can, to help me in my work of being a domestic missionary. If you haven’t already signed on to help me, would you? I need your help. Find out what I do with my time, how you can help, and the benefits of being a financial partner here. So I asked God immediately to fill me up with His perfect love that casts out fear. I saw myself being slowly filled up with liquid, as if I were a human-shaped bottle. The liquid was blue. It was the perfect love of the Father. I saw this liquid first fill up just the tips of my toes. But it kept on filling me: up my foot toward my ankle, then up my shins, and continuing all the way up my body. This vision of being filled with Father’s love continued. There were a few places that it seemed to slow down. When this blue liquid got to my lungs, it paused awhile there. I meditated some more on Papa’s love, and on His words: “Perfect love casts out fear.” Then I saw the blue liquid start to fill up my lungs and chest, and suddenly it was like my lungs ripped free. I breathed deeply–for the first time in a long time. A similar thing happened when I saw the blue getting up to my heart. I kept meditating on the Father’s perfect love for me; and after a few moments, the blue continued up toward my shoulders, filling my heart. When it did, I literally felt the healing of the Father in my heart and emotions. This vision continued until I saw my entire body filled up and sloshing with Father God’s perfect love. God healed me from fear that day. I was immediately able to breathe again. The spirit of fear left me–because God’s perfect love cast it out. Too often, we try to get rid of one bad thing without replacing it with the good and holy thing. But Jesus taught that we have to be filled with the good thing in order to keep the bad thing out (Matthew 12:43-45). Do you struggle with fear? You can be healed too. There is absolutely a 100%-cure-all solution to fear, and you can be healed from fear right now, today. The solution to fear is love; perfect love casts out fear. If you will let God make you perfect in His love, you will be free from fear. It will be a journey, as it has been for me, but He WILL make you perfect in love, and He can free you from fear right now. If you can identify with this story, and want to be free from fear, would you meditate on the vision above in your mind? Imagine yourself being filled with Papa God’s love, like a you-shaped bottle. Ask Him to make you perfect in love. Papa’s perfect love will cast out fear, and you will be free. Image courtesy of ajari on Flickr via Creative Commons license. Thanks so much for reaching out. I used to struggle with fear terribly too, so I have compassion for your situation. I can tell you that the antidote to fear is love. Lots of people think the opposite of fear is faith, but it’s not. It’s love. First John 4:18 says “There is no fear in love; but perfect love casts out fear, because fear involves torment. But he who fears has not been made perfect in love.” So that tells us that, when we struggle with fear, it means we haven’t yet fully received God’s love for us. I pray it will help you as it helped me. Also, you might really benefit from listening to a sermon by Chris Gore called “The Secret of John”, which you can purchase at the Bethel Church store and download. It is all about how you don’t have to try to work for love, and how it’s not all about how much YOU love God–but rather life is all about how much HE loves YOU. 🙂 It’s a very freeing concept, and will really help you receive God’s love. Other than that, please, meditate on His love. Look up and read Scriptures about how much God loves you, and chew on those. His love will heal you and will cast out all fear. Blessings. I’d love to hear about it if these things help you. It’s all about His perfect love for you. That is the solution to fear. This gives me such peace. I have been struggling with fear on and off and I know this will help. Thank you so much. Oh, I’m so glad, Charmayne. Praising God with you. He loves you so much and is ready and eager to fill you up with His perfect love. I bless your heart and spirit with opening up to receive all His love, peace, and the ministry of the Holy Spirit, in Jesus’ name. Thank you SO much. THANK YOU THANK YOU THANK YOU! ha. I simply can’t say it enough! I knew that this year God would be dealing with me fear. I had no idea how. This fear has been rooted so deeply and it was effecting EVERYTHING. It kept me from having hope, loving others fully and rightly with brotherly affection, and even forgiving others and trusting God. From abandonment from both parents, childhood abuse, all SORTS of things, it seemed as if fear was always with me . At the end of 2014, I asked Jesus (in prayer) what He wanted to deal with me on for this next year. I had never done that before. He spoke clearly, “It’s time to let go of this fear. ” Soon after, I began dating (my now fiance). Talk about stretching. Ha. A family was something I knew I was designed for. Over time God was also making it clear that I should be praying for and preparing my spirit for my future spouse. Little did I know, he would be bringing this around sooner than I thought. Fast forward a few months- God has been revealing SO much from my past that was keeping me captive to FEAR. As a bonus- through His grace and mercy, God has been helping both my fiance and I to have increasingly MORE freedom from fear and anxiety. Lately, my fiance has been having severe anxiety attacks. These attacks effect his sleeping ,breathing, mood, etc. I’ve also been fighting off depression, fits of anger, etc. All rooted in FEAR. This morning, I dropped him off and he forgot to give me hug. I was so hurt. I knew it was rooted in my fear of rejection, not being good enough, Etc. SO (after much trial and error) I ran QUICKLY to Jesus in prayer. I confessed my hurt, my thoughts (that were fear based) and he just scooped me up in His love. What started as a prayer of surrender ended in me worshipping Jesus, praying for me fiance and our marriage, and thanking God for all He has done by sacrificing Jesus IN LOVE! There’s so MUCH that God is doing in this season. And I thank Him that all He is doing, has done and will do is for LOVE. ALL OF IT! For LOVE. I don’t think the love of Christ has been as real to me as it is now. And I thank Him for it every day. Simone, that’s amazing. Wow. Thank you for sharing! Yes, He wants to make you and me and all His kids perfect in love and set us free from fear! I’m so grateful, and I’m beyond thrilled to hear about how He’s working in your life! May Papa God continue to bless you richly! Thank you very much for listening to God’s voice and writing the article about how to get rid of fear. It has blessed immensely. May God continue to give you the wisdom to write such powerful Spirit filled blogs. This helps a lot. But I also asks God to protect the little child inside me (my subconscious mind). By the way, since our conversation Jamie, I don’t feel rage or anger towards my ex. Thanks for the prayer! I know and understand how you feel sister. Fear takes a lot of space in my life and I’m tired of it. But at least I can see that there’s a lot of people who have the same fears as me. Yes and now we have the weapon to cast out fear and that is LOVE. I believe in this scripture so much 1 John 4:18 there is no fear in love; but perfect love casts out fear, because fear involves torment. But he who fears has not been made perfect in love. I know that love was somehow absent when I grew up and I am now 38 years by the grace of God. I never felt loved but fear find its place in me and now that I have find Jesus I have find perfect Love. And this scripture feels to me like hearing it for the first time cause it quenched my spiritual thirst in love. I am going through the same thing . I always was afraid of the judgment of God. Instead of turning towards him I rejected his holy fear . I was so scared about doing wrong like the children if Israel. That I ended up doing wrong against him. I am now more afraid of the judgment of God upon me. It’s more a trembling fear than a repent one which I want. I feel . Like I am alone in the desert and that Gods Holy Spirit has left me. I always thought that people can choose to come back. Why do I do the opposite of what I want? I feel like I fallen in the same sin as the I died. I I have had the Holy Spirit from a young age I became a Christian at a young age. I thought I would never depart from God. I did. everything I feared. I feel like Judas. That it would be better if I was never born Please pray for me Then to do this thing. Was there hope for him? Please pray for me. Did you ever get your healing? Are you ok? Oh my, this sounds like what is happening to my husband. I’ve felt like he is being oppressed and going through spiritual warfare for over 2 years now. Thank you so much for sharing. Hello. I googled Deliverance from fear as fear gripped my heart from 2004 and I feel it’s influence in my life even now. We used to pray as youth in our local church, and when one of my prayer partners testified about a demonic attack and his victory in prayer, fear gripped my heart instead. I took a decision then not to be serious in God’s work. I took bad decisions because I really didn’t seek God seriously and hence I have paid dearly. I also know a lot of things contribute to the fear including that I have lived with albinism and I sometimes fear rejection and criticism. Now I have a family and I need God’s love to be able to guide me and my family. I have a lot of plans and I have lots of spiritual battles I have been fighting in prayer, I Know this fear stalls my progress and victories. I have said many and confused issues but what I Know is I need to be rid of fear and I need the peace of mind. I need be completed in God’s love and experience him directly in my life. I wrote this because I thought the fear I saw above is a bit different but as I write I realise it’s all fear and I need help. God bless you for this post about fear. I know the word, I am a true believer. This year have been aweful with fear. I have been praying, seeking the Lord, waiting, crying, asking God to delivery my daughter from alcohol, and mental health. It’s been so hard for me. But I am trusting God and waiting on him. I am asking him to fill me and her up with his perfect love and cast out this fear. In the name of Jesus. I am losing hope because of fear. Please pray for me. God bless you for your wonderful encouragement. Hi. 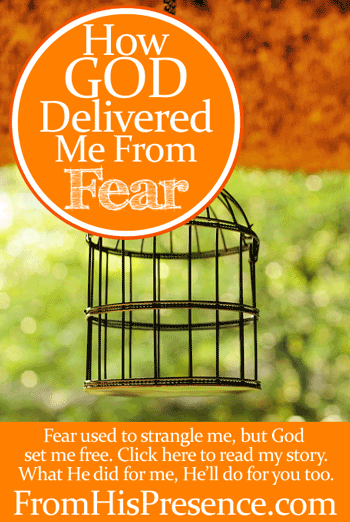 I prayed for God to feel me with his love and get rid of the fear. Thanks very much for your testimony and encouragement. Thank you for sharing this! I’m a child of God, who is in need of deliverance. I’ve never had to put up with these types of attacks until here recently. I’m 22, and I know the Lord has a ministry for me. I’ve been very anxious and fearful. It almost feels like I’m trying too hard to focus and think like I’m gonna lose my mind. It’s been hard for me to sleep. But I’ve called out to God, prayed in my holy language, been anointed with oil, and it seems to still linger and hold on without relenting. It almost feels like I’m gonna lose control, but I know who sits on the throne. I’ve been doing my best to meditate on His word and I have completely put my trust in Jesus for my healing. But I’m struggling with letting it go, the enemy is mad I’m talking with a young man, I feel God has placed in my life who loves him but he struggles with severe anxiety, but He has the call on his life. And now I fear I’m being affected. I just don’t want to lose touch with reality! Please asking for prayers for the miraculous to happen in my life. Many blessings. ,please pray for me so I will be free totally in Jesus name. Thank-you for sharing. I am a husband and father of six children; and I have struggled with fear, primarily of disease, but other fear as well, for over 35 years. It ended a career in the fire service (couldn’t handle the medical calls), and then a second career as a teacher, and has strained relationships. It can be so debilitating that sometimes I pray that God would take my life in a car crash or other accident if He chooses not to heal my mind. I have memorized large portions of scripture, been to counseling, prayed, been prayed for, fasted, etc. Sometimes I can go awhile without a problem and then I get blind-sided by the same old fears. I feel isolated, alone, ashamed as a man, and almost without any hope. My dear wife of 29 years has tried to see me through this; I am just so tired of being afraid, and so tired of being me. I have quit telling people about it, so those around me believe me to be a solid Christian, community member, husband, and father; no one would guess the anguish alive in my mind. I will try your idea regarding meditating on God’s love filling me. Please pray for me. Thanks so much for writing in. If I may ask – how was/is your relationship with your earthly dad? In my experience with inner healing and transformation of the mind, I have always seen fear to be a father issue. And it goes away when a person is filled with perfect love, which happens easily when the father issue is healed. I have a whole class on this. Please let me know. Hello, Jamie; I had a good relationship with my dad; he provided for our family and gave out fair discipline. I don’t know why I have struggled so much with fear. Even as a boy, over 40 years ago, I remember being really afraid of certain situations or things. I know that God is always good and is not looking to punish me, but at the heart of my fear is a looming sense that if I ever really completely trusted Him, He would not be there, and I would be left utterly alone and without hope. Thanks for your reply; God is good, all the time.